The strangest of lizards is the Thorny Devil. This is the only species in its genus. The lizard's body has conical spines all over, including spines above each eye and a hump behind its head which is spiny. The tail is also spiny. Its spines make it easy to identify. The color changes on the Thorny Devil's body from yellow to reddish brown to black, depending on which type of soil it is crossing. They change colors to be camouflaged and makes it easier for them to hide. The total length they can grow is 20 cm. This lizard is a harmless reptile. When the lizard walks, the lizard's tail lifts and it walks in a shaky way. People say its a slow moving creature. The Thorny Devil is found in Western Australia, and North and South Queensland. 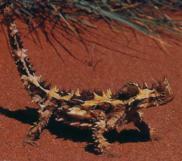 The Thorny Devil lays about 3 to 10 eggs underground, between September and January. The eggs hatch 3 to 4 months later. They reach maturity after 3 years. The Thorny Devil lives for about 20 years. The Thorny Devil is one of the least aggressive reptiles. It likes to defend itself but has weird ways of doing it: 1) They have the ability to change colors to match their environment. 2) They hide in small shrubs. 3) When they're scared they put their head between front legs, which shows a fake head or knob on its neck in the place where a normal head should be. 4) If a predator tries to flip it over it puts its spine and curved tail against the ground to prevent it from falling over. 5) Its movement looks like a leaf, and it often "freezes" instinctively. 6) They have the ability to puff themselves up like a ball, which makes them look bigger. The Thorny Devil usually eats ants, eating a very large number of ants in a single meal, about 600 to 3000 ants! They can only eat one ant at a time with their sticky tongue, but can eat at a rate of up to 45 ants a minute. The Thorny Devil is a prey animal, because it's a small, slow moving creature. Their worst predators are humans and Bustards (a type of bird). The Thorny devil has to be careful about the Bustards, because it can just swoop down, and at least hurt it. The Bustards is found on many continents, and is the size of a chicken. The Thorny Devil is an endangered animal. People have been saving the Thorny Devil's nests and eggs by placing wire enclosures around the nests. By doing this they are keeping predators out and hold the babies in after hatching. This technique seems to be working. When the Thorny Devil goes to sleep at night, it digs up the soil, and covers itself with it to stay warmer during really cold nights. The Thorny Devils dig themselves underground burrows, sometimes under scrub to provide protection from the heat. "Thorny Devil or Moloch", http://www.goggle.com/search?q=Thorny+Devil.